So, we had quite the last holiday as a family of 3. We spent the better part of July 4th playing games, eating tacos, & baking…then our A/C went out & I was having Braxton Hicks contractions for a decent part of the night. Definitely an interesting day, not short on the excitement! We set up our Xbox Kinect and let Lucas play a few games, sports of course. He loved it and was so into it! He was playing baseball and golf and would dance when he did something good. It was too cute. We ended up having to spend the night at my parents because like I said, our A/C went out, and that definitely does not work for 8 months pregnant me 😖 Lucas was excited though because he got pizza and an icee for dinner. Ah, the life of a two year old! 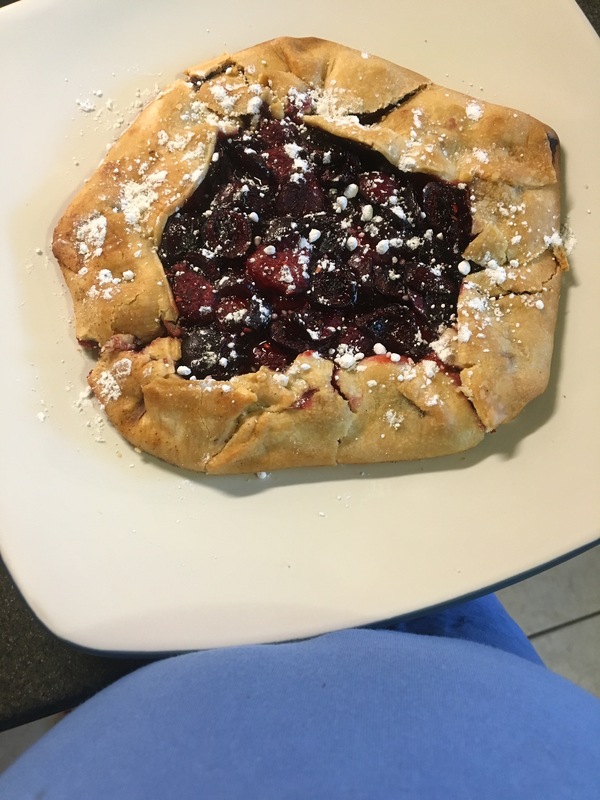 Before the horror of our A/C going out, I ended up baking a cherry & raspberry crostata that was really delicious. I was pretty impressed with myself, not going to lie. I was inspired to cook this a few days ago by a blog I love to follow, Cupcakes and Cashmere. I ended up using two different recipes, one from Whole Foods & one from Daphne Oz from ABC’s The Chew, both can be found here and here. 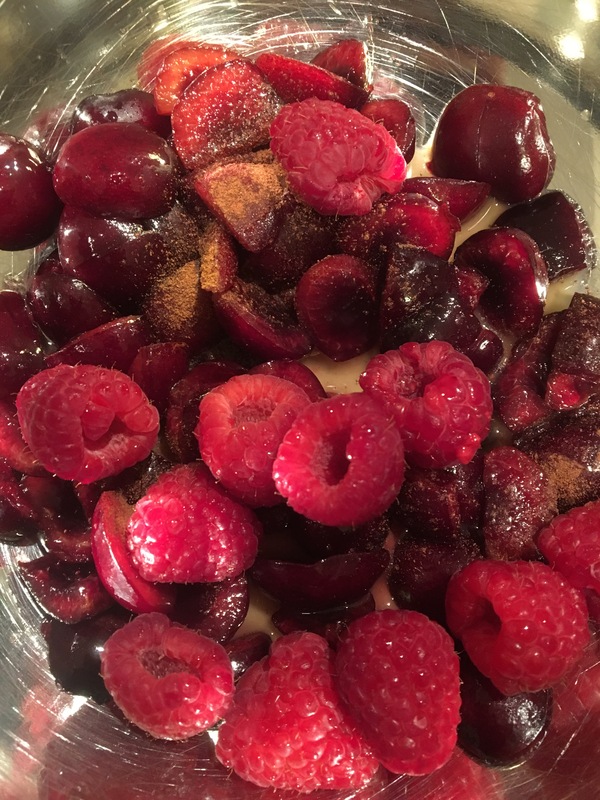 I ended up subbing in some raspberries, honestly just because I didn’t feel like cutting up any more cherries, and it ended up tasting really good! 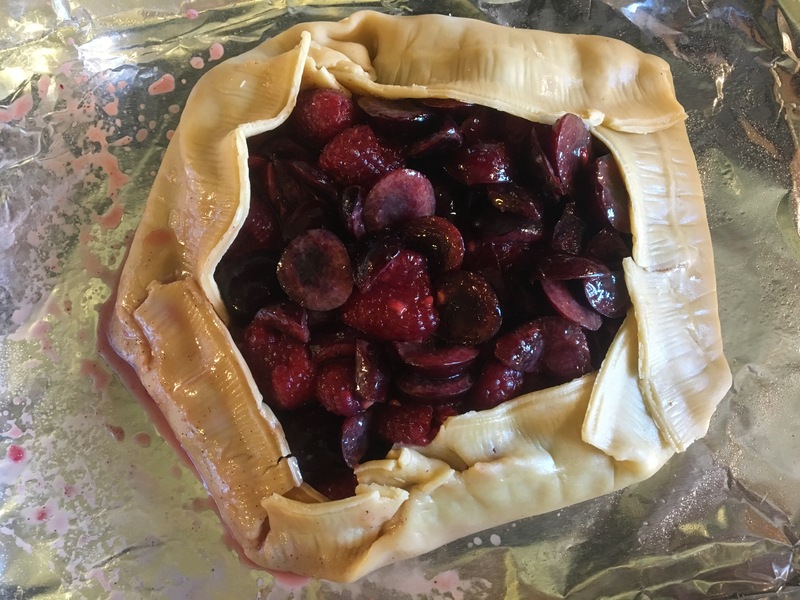 It was a little more tart than sweet, but I didn’t follow the recipe exactly and used it more as a guideline, so if you actually use the amount of sugar it says to add I’m sure it would be more sweet. I like my fruit desserts tart though, so it was perfect for me! I also cheated a little and used a store bought pie crust, and it worked out just fine. I did not feel like putting in the effort to make my own crust, but I’m sure it would be just as if not more delicious! Logan making an appearance, trying to help me bake! Today has definitely felt like a Monday, with lots of stress about our A/C unit & what not. Hoping that issue gets resolved and that I don’t put myself in to labor!